When it first came on to the cycling scene, Gore Bike Wear changed our most basic ideas about what it means to ride in inclement conditions, and the Oxygen Gore-Tex Active Shell Jacket is the top of the heap when it comes to winter-weight protection that breathes. It won't change the weather in the climate around you, but it will preserve a more pleasant microclimate between it and your skin. Active Shell defines the, so you won't become sweat-soaked in an attempt to ward off rain, and Gore engineered the Oxygen with zippered vents at the forearms and sides to help you stay cool when the drizzle takes a brief break. The side vents also provide easy access to jersey pockets, so you can stuff gloves and ear warmers in when you don't need them. 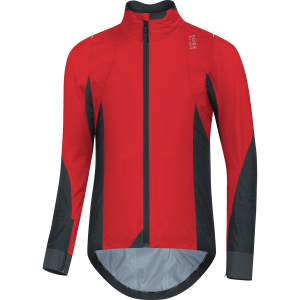 Cut slim, the Oxygen will slide comfortably over a jersey but won't flap in the breeze when you get low during a wet and extra-exciting descent. A partially elastic hem keeps your lower back covered up when you're in the drops and the high collar sits comfortably against your neck. The collar is also reinforced, which makes working the front zipper with one hand a simple task. Gore finishes the Oxygen with a full complement of reflective details so you don't find yourself being ridden off the road by sleepy commuters when you're out for a misty, early-morning training ride.